You are here: Home / Behind the Scenes of a Book Author / Tri-City Herald / Last Chance for a Springer? Arriving at the outskirts of Umatilla at high noon, I found empty a roadside gravel parking lot that held a dozen vehicles during the peak of the run. Suppressing nervous anticipation, I tromped through overgrown reed canary grass and waded shallow rapids to reach a small island that split the river’s flow. The thunder of 4-foot high falls greeted me. Adding to the ambience were cigarette butts, discarded leaders, an empty sardine can and rotting salmon guts. The stench of sun-baked bait roe and decaying algae wafted in a light breeze. Welcome to Chinaman Hole. A recent email update from the Oregon Department of Fish and Wildlife granted a three-week extension to the spring Chinook salmon season and gave hope that I would not finish my season “blanked,” as Scottish anglers say. Chinaman Hole failed to produce for me on a previous visit in early May when combat fishing was in force. I watched several salmon jumped the falls though, including one that cleared the water’s surface by a good two feet. In contrast, no salmon jumped or rolled today, but I was optimistic because I brought bright orange bait roe that looked good enough to eat off a cracker. What holds my interest about Chinaman Hole is choice of technique. I can sink my offering in deep pools, let it drift through shallow rapids or float it under a bobber. On this warm summer day without competition from other anglers I chose to start at a deep bathtub-shaped pool where I caught my first Umatilla River salmon. The power of a springer on the end of your line tends to linger. I couldn’t help think that another fish was waiting for me. River salmon seek specific places to swim, rest and hide during the spring migration period. After fishing this same stretch of river for over 20 years, I could draw you a map of all the places where they are caught. During low water, however, the only sure upstream route involves jumping the falls. Moving to the base of the falls, I dropped my bait into swift current that ebbed and flowed like the ocean tide and imagined how it looked and smelled to a salmon. I listened to the serenade of redwing blackbirds and admired an incandescent-blue damselfly that landed on my left wrist. You are never alone on a river. Admittedly, I was watching a white pelican scoop up a meal of juvenile bass when I felt a quick tug on my line. Shaking free of my reverie, I set the hook and was fast into the unmistakable pull of a springer. After a series of head shakes it went top water but my hook held firm. Two more wild jumps, a long run that made my spinning reel sing and it returned to the security of the falls. Only when the deep-bodied salmon turned on its side did I work it to the shallows where this year’s crop of minnows scattered. I looked to see if was a hatchery fish, but its adipose fin was raised like a flag. A wild salmon that, if released, ensures the cycle of life continues. Many moons had passed since I caught a fish large enough to make me shake. I would have lit a cigarette to calm my nerves but I don’t smoke. I carefully removed my hook from the corner of the salmon’s clenched jaw and watched it swim off to resume its long journey to spawning grounds located deep in the upper Umatilla River canyon. Some anglers might argue you can’t count what you don’t keep, but it’s become a catch-and-release world. I didn’t need a salmon for the grill because I’m still eating last year’s harvest of hatchery fish. But I did need to know that I could catch a salmon if only to prove that I could. 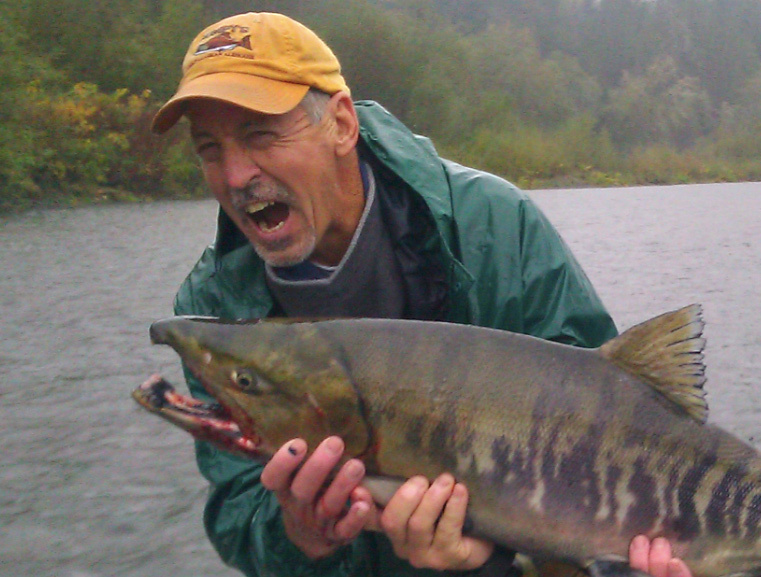 Releasing a wild salmon is a victory both for the river and for the angler.